According to popular opinion, if you want good coffee, you should buy Arabica beans and nothing else. We will show you why Robusta beans are often underestimated, explain that they are not actually called Robusta, and that there is no one coffee variety that can be considered the best. Most people are well aware that coffee is not just coffee. There are various roasting and preparation methods, and the coffee countries themselves also have their part to play in determining the flavour profile of the beloved bean. Very few people think of coffee variety. All they know is that Arabica is good and Robusta is bad. But just like in real life, things are never quite so black and white – there is a big grey area in between. Or, as in this case, a brown one. Canephora and Arabica – is that really it? But first things first. Let’s be clear that Coffea arabica and Coffea canephora (more commonly known as Robusta) are biological species of the coffee family – and they are not the only ones. Coffea liberica and Coffea excelsa are another two. But we simply never hear about them, because 99% of the coffee produced commercially is either Arabica or Canephora. But why? Because history says so. The Arabica plant, for example, is assumed to have originated in Ethiopia, but was brought to Europe via Yemen in the seventeenth century. And because only the two varieties Typica and Bourbon grow in Yemen, hardly any other Arabica varieties are ever grown nowadays. There are, however, a huge number of coffee varieties within the Arabica species that have a great deal going for them, not only in terms of taste but also genetically. Some have a natural shield that protects them from parasites, while others are naturally caffeine-free, or perfectly protected against strong winds. This is particularly appealing in view of the fact that climate change will have a drastic impact on growing conditions over the coming decades – and ever more resistant plants will be required. 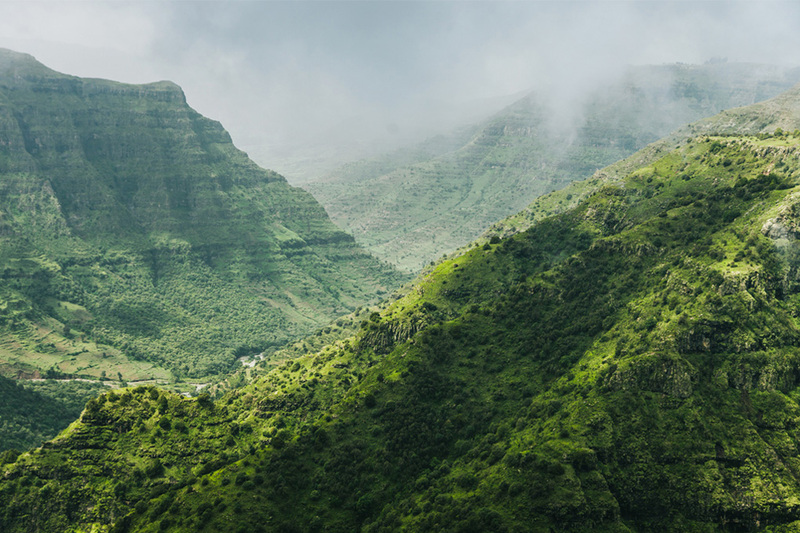 In species-rich Ethiopia in particular, biologists and researchers are currently working on identifying the various species. No fewer than 124 Coffea varieties have been discovered so far – some 20 years ago, just half of these were known. And the Canephoras? They have a comparable pedigree, but were simply introduced from West Africa much later. In the case of Canephora, however, no distinction is made between the different varieties – but not because there aren’t any. 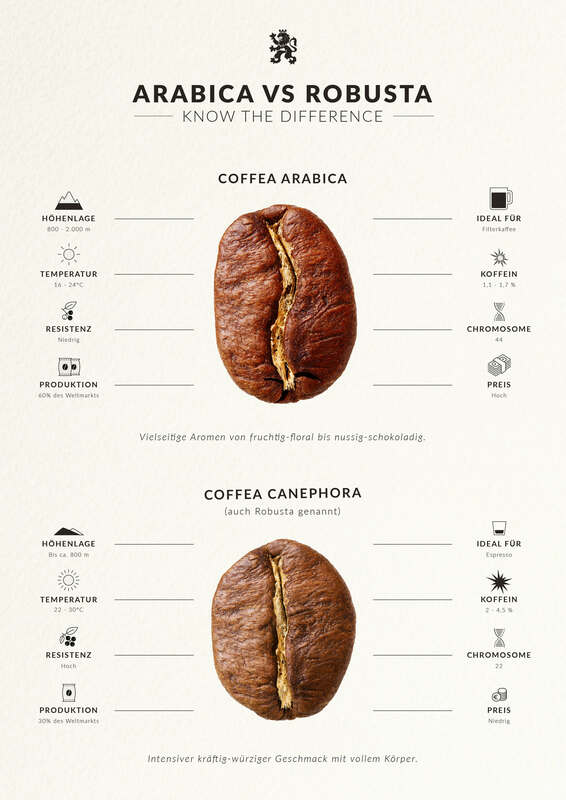 The range of flavours is simply not as diverse, and therefore not interesting for subcategorisation – which is why we generally refer to Robusta when we actually mean Canephora. The fact that the Canephora varieties have less going for them in terms of flavour is due above all to their genetic make-up. While the Canephora plant has 22 chromosomes, the Arabica has twice this number. Replete with these 44 chromosomes, the Arabica bean is able to develop much more characteristic flavour profiles. Canephora – the MacGyver among coffee beans? It cannot be said, however, that the Arabica bean has a genetic advantage – in nature, it has a much harder deal. In contrast to the Canephora plant, it only survives at high altitudes where temperatures are lower, at around 15°C to 25°C. As the name Robusta suggests, the Canephora plant is more resistant. Higher temperatures of 20°C to 30°C are no problem, which is why it can also be planted in lowlands, and is rarely found above 900 metres above sea level. It needs more rain, however, as its flat roots are closer to the surface of the soil. The Arabica plant sends its roots down further, and flowers even if the upper layer of the soil is dry. Externally, the beans are easy to distinguish – the typical line through the middle of the bean is curved with Arabica, and straight with Canephora. When it comes to straightforward survival, therefore, both varieties have their pros and cons. That’s all very good, but what about flavour? We think they both taste very similar. It is all a question of how the coffee is prepared, and what we expect from it. Lovers of filter coffee are more likely to reach for one of the diverse Arabica varieties with their characteristic flavour profile, which includes everything from floral, citrus and berry to nutty, caramel and chocolate notes. A pretty colourful mix! While the Canephora bean cannot boast quite such a diverse array of flavours, its distinctive taste is much more full-bodied, powerful and aromatic. 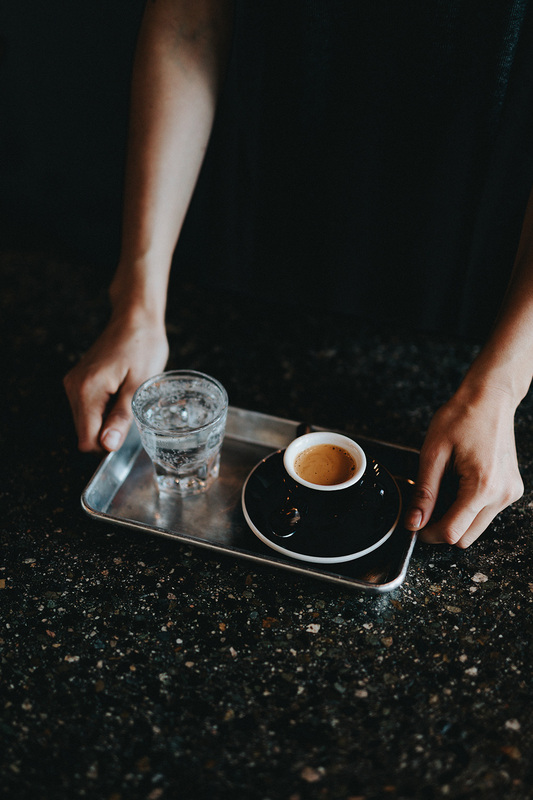 A higher caffeine content and thick crema make it the perfect espresso – the Italians are particularly fond of the Canephora bean. And they should know. Where does the Canephora bean’s poor reputation come from? Partly from its robustness. Its cheaper cultivation automatically makes it a cash crop in many countries – providing a quick profit for lower quality. Little attention is paid to how the beans are processed, however. The misconception is also often due to incorrect roasting procedures. As the beans contain less sugar but more caffeine and chlorogenic acid, they need to be roasted for longer, or they will simply be too bitter. Chlorogenic acid is, incidentally, the reason why coffee beans are considered to be bad for the stomach, but in fact it disappears completely during a longer roasting process. Cheap coffee – Arabica included – is often not roasted long enough and therefore contains more of this disagreeable stomach upsetter. Grown, processed and roasted correctly, every variety has its own individual benefits, which is why we buy both Arabica and Canephora beans – and also, in small quantities, the two exotics Excelsa and Liberica. This complete selection is then used to create the carefully composed blends or characteristic single origins, so that each and every consumer can find exactly the kind of coffee they want. Or, if they want, try something different every time.